Severe pain, gas and fluid seep from wound, blackening of overlying skin; shock and death commonly follow Usually 1 to 5 days Usually Clostridium perfringens; other clostridia less frequently Organism grows in dead and poorly oxygenated tissue and releases a-toxin; toxin kills leukocytes and normal tissue cells by degrading the lecithin component of their cell membranes; involvement of muscle causes shock by unknown mechanism Wounds of war; dirt contamination of wounds, tissue death, impaired circulation to tissue as in persons with poor circulation from diabetes and arteriosclerosis; self-induced abortions Prompt cleaning and debridement of wounds is preventive; no vaccine available.Treatment: surgical removal of dirt and dead tissues of primary importance; hyperbaric oxygen of possible value; antibiotics to kill vegetative C. perfringens of marginal value wounds and occasional surgical wounds, gas gangrene of the uterus is fairly common after self-induced abortions, and rarely, it can occur after miscarriages and childbirth. In other cases, impaired oxygenation of tissue from poor blood flow because of arteriosclerosis, otherwise known as hardening of the arteries, and diabetes are predisposing factors. Cancer patients also have increased susceptibility to gas gangrene. Neither toxoid nor vaccine is available for immunization against gas gangrene. Prompt cleaning and debridement of wounds, the surgical removal of dead and damaged tissue, dirt, and other foreign material, is highly effective in preventing the disease. Treatment of gas gangrene depends primarily on the prompt surgical removal of all dead and infected tissues, and it may require amputations. Some authorities recommend hyperbaric oxygen treatment because it inhibits growth of the clostridia, thereby stopping release of toxin, and it also improves oxygenation of injured tissues. In this treatment the patient is placed in a special chamber and breathes pure oxygen under three times normal atmospheric pressure. Some people appear to improve dramatically with hyperbaric oxygen, but others show no benefit and develop complications from the treatment. Antibiotics such as penicillin are given to help stop bacterial growth and toxin production, but they are of minor if any value in treating the disease because they do not diffuse well into large areas of dead tissue and they do not inactivate toxin. Table 27.5 describes the main features of this disease. Figure 27.13 "Lumpy Jaw"(Actinomycosis) of the Face Abscesses, such as the one shown, form, drain, and heal, and then they recur at the same or different location. Sulfur granules, colonies of Actinomyces israelii, can be found in the drainage. 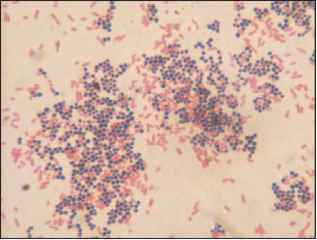 Figure 27.14 Actinomyces israelii Sulfur Granule Microscopic view of a stained smear of pus from an infected person. 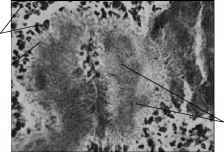 Filaments of the bacteria can be seen radiating from the edge of the colony.